I love soup season. Although, I tend to make soups year round. This one is particularly fitting for winter because mushrooms pack an immune-boosting punch. Those winter sniffles and coughs don’t stand a chance against this cold-fighting stew. I added a potato, which is certainly optional; I just thought it added a bit more heartiness. If you choose to omit the tuber, I recommend reducing the amount of broth by about a cup to a cup-and-a-half. This dish is super easy to make. I took a cue from my Wild Rice & Potato Stew by using Tofutti sour cream, almond milk and flour to give it that creamy goodness. I guarantee you’ll look forward to leftovers! In a large soup pot, melt the Earth Balance and add the garlic; cook 2 minutes. 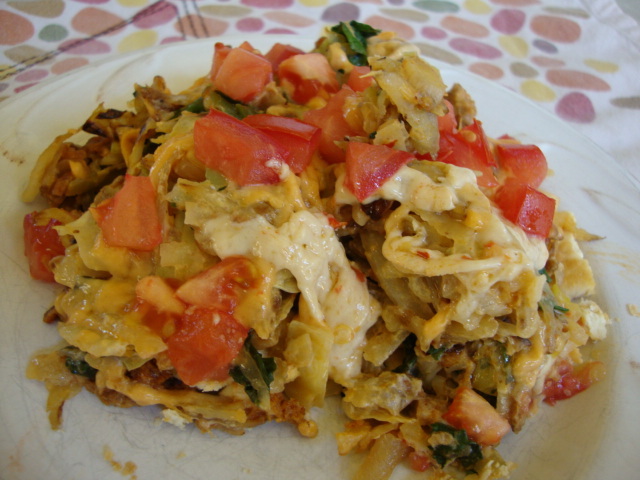 Add the celery and onions and cook for 5-7 minutes, or until they have softened. Add the sage, thyme, and black pepper and cook another minute. 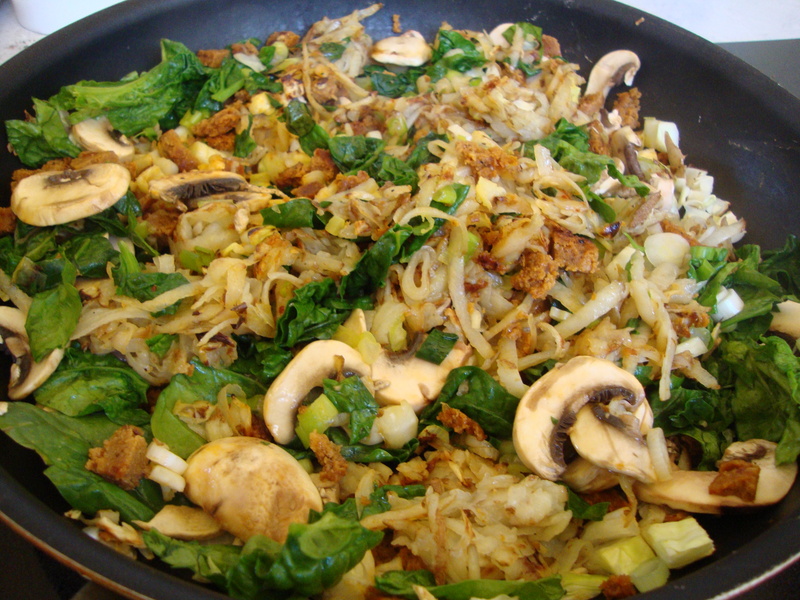 Add the mushrooms and combine well with the celery and onions; cook 5 minutes. Next, pour in the broth and add the bay leaf. Bring to a low bowl and add the potato (if using). Reduce the heat and let simmer for 20-25 minutes. Once the potatoes are softened (but not mushy—unless you like that sort of thing), add the jarred mushrooms. I had a jar in the pantry for a recipe I ended up not making for one reason or another, so I thought this was the ideal soup to add them to. Cook until they are heated through. You can fish out and discard the bay leaf now or later; doesn’t really matter. In a small bowl, whisk together the sour cream, almond milk, flour, Herbs de Provence, and nutritional yeast. Add the mixture to the soup and stir well to combine it thoroughly. Serve with some fresh chives on top and season with salt, if necessary. Enjoy! I love soup season. Although, I tend to make soups year round. This one is particularly fitting for winter because mushrooms pack an immune-boosting punch. Those winter sniffles and coughs don't stand a chance against this cold-fighting stew. I added a potato, which is certainly optional; I just thought it added a bit more heartiness. If you choose to omit the tuber, I recommend reducing the amount of broth by about a cup to a cup-and-a-half. This dish is super easy to make. I took a cue from my Wild Rice & Potato Stew by using Tofutti sour cream, almond milk and flour to give it that creamy goodness. I guarantee you'll look forward to leftovers! 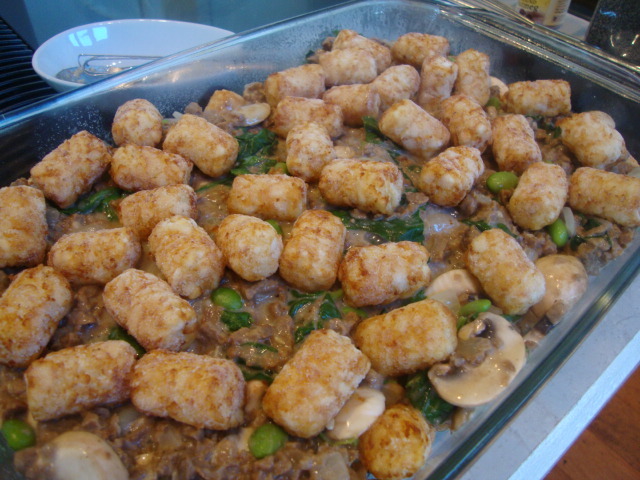 Once the potatoes are softened (but not mushy---unless you like that sort of thing), add the jarred mushrooms. I had a jar in the pantry for a recipe I ended up not making for one reason or another, so I thought this was the ideal soup for them. Cook until they are heated through. You can fish out and discard the bay leaf now, or later; doesn't really matter. In a small bowl, whisk together the sour cream, almond milk, flour, Herbs de Provence, and nutritional yeast. Add the mixture to the soup and stir well to combine it thoroughly. Serve with some fresh chive on top and season with salt, if necessary. Enjoy! A friend gave me this recipe over the weekend and I’ve made 3 of these so far! I added a tablespoon of chia seeds because of their amazing health benefits, but you can leave them out if you’d like. Please note, you don’t have to use peanut butter AND protein powder, but if you omit the protein powder, I suggest using vanilla almond milk or a vanilla flavoring for taste. Bottoms up! 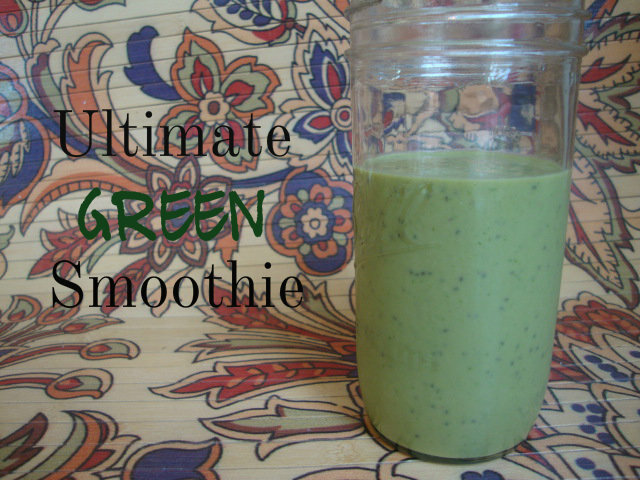 Blend 2-3 minutes in a blender until smooth. Enjoy! I was in a baking mood today, but I couldn’t decide between these, chocolate chip scones, or lemon madeleine cookies. Obviously, I went with these cupcakes from Colleen Patrick-Goudreau’s The Joy of Vegan Baking. If you love to bake, vegan or not, this is a fabulous cookbook to own. Not only is it filled with easy and delicious recipes, it also is filled with lots of valuable baking tips, especially if you are new to the world of vegan baking. I found that these cupcakes are really more like muffins, but if Ms. Colleen says they’re cupcakes, then I’ll go with it. Cupcakes, muffins, whatevs—you’ll love them! For the frosting, I didn’t go with her Butter Cream Frosting. 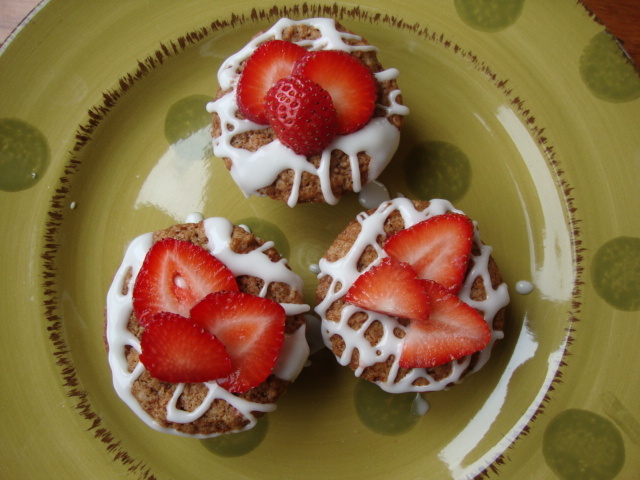 I used confectioners’ sugar mixed with almond milk. Preheat the oven to 350. Lightly grease or line a muffin pan with muffin cups. I only had 9 muffin cups, so I greased the last three. 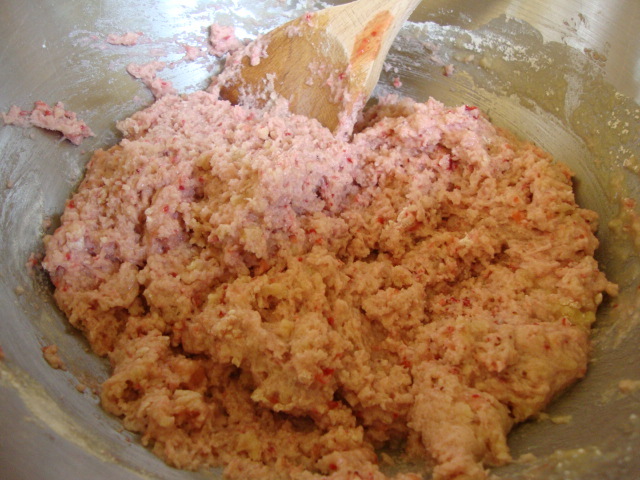 Both methods worked fine.I pureed the strawberries in the food processor. Mix the flour, baking soda, and sugar in a large bowl. In a small bowl, combine the oil, vinegar, and vanilla. Stir in the strawberries. 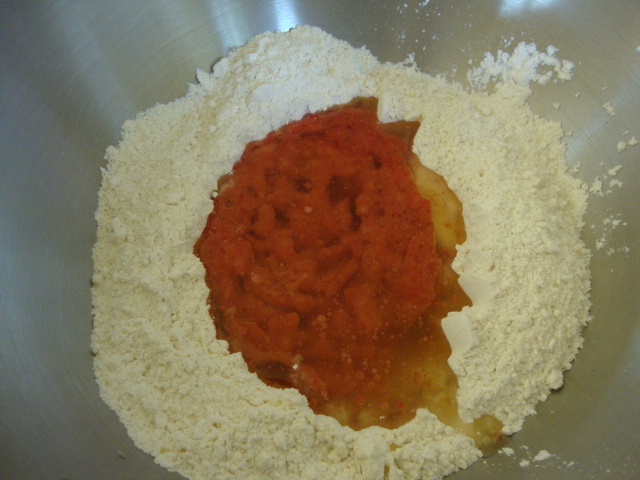 Make a well in the dry ingredients and pour the wet ingredients into it. 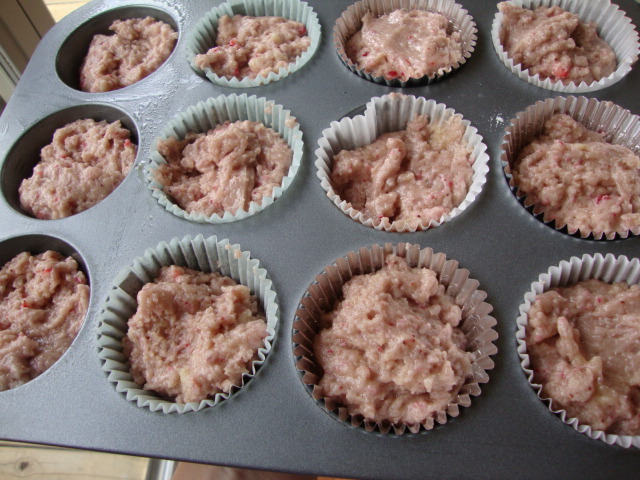 Evenly fill the muffins cups with the batter. Bake for 25-30 minutes. Remove from the oven and place onto a wire rack to cool. Let them cool completely before icing them. I just mixed a few cups of confectioners’ sugar with just 1-1/2 to 2 tsp of almond milk to reach a very thick consistency. If you’d like, you can add a dash of extract flavoring to it. 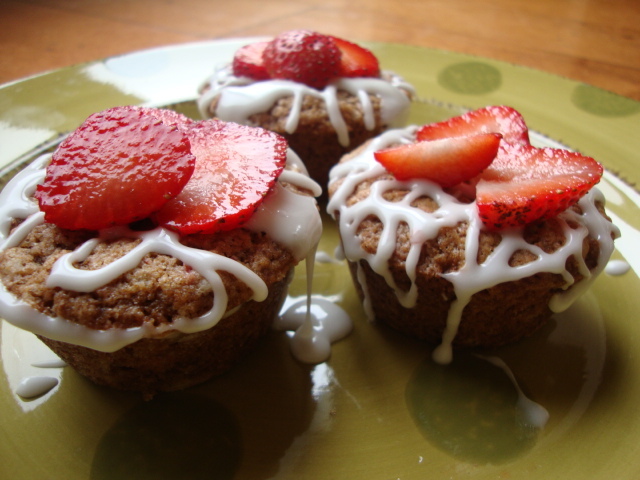 Drizzle the tops of the cupcakes with the icing and top with a few strawberry slices. Enjoy! Makes 12. I was in a baking mood today, but I couldn't decide between these, chocolate chip scones, or lemon madeleine cookies. Obviously, I went with these cupcakes from Colleen Patrick-Goudreau's The Joy of Vegan Baking. If you love to bake, vegan or not, this is a fabulous cookbook to own. Not only is it filled with easy and delicious recipes, it also is filled with lots of valuable baking tips, especially if you are new to the world of vegan baking. I found that these cupcakes are really more like muffins, but if Ms. Colleen says they're cupcakes, then I'll go with it. Cupcakes, muffins, whatevs---you'll love them! For the frosting, I didn't go with her Butter Cream Frosting. I used confectioners' sugar mixed with almond milk. Stir to combine, but don't over-stir. You'll be left with a light and fluffy batter. Let them cool completely before icing them. I just mixed a few cups of confectioners' sugar with just 1-1/2 to 2 tsp of almond milk to reach a very thick consistency. If you'd like, you can add a dash of extract flavoring to it. Drizzle the tops of the cupcakes with the icing and top with a few strawberry slices. Enjoy! Makes 12. This recipe is from The Ultimate Uncheese Cookbook. I was intrigued. I’ve tried lots of other recipes from this cookbook and many have been outstanding, but there have been a few that just didn’t do it for me. I was nervous about this one. Surprisingly, however, it’s pretty delicious. I wouldn’t say it’s like brie; both with consistency and taste, but it does taste very good. The recipe doesn’t mention this, but I highly recommending briefly warming this cheeze in the oven or microwave. It only takes about 10 seconds in the microwave. It seems to taste better when it’s a bit melty. I also think this would be really tasty with some warm fruit compote over the top, such as warmed raspberries and blueberries. The possibilities are pretty endless! Lightly oil a 2-1/2 cup round mold. I used a Pyrex bowl, but you can also use a pie plate or cake pan. Dust the bottom of the bowl with either the wheat germ or toasted almond slices. I used the wheat germ; set aside. Combine the water and agar flakes in a small saucepan. 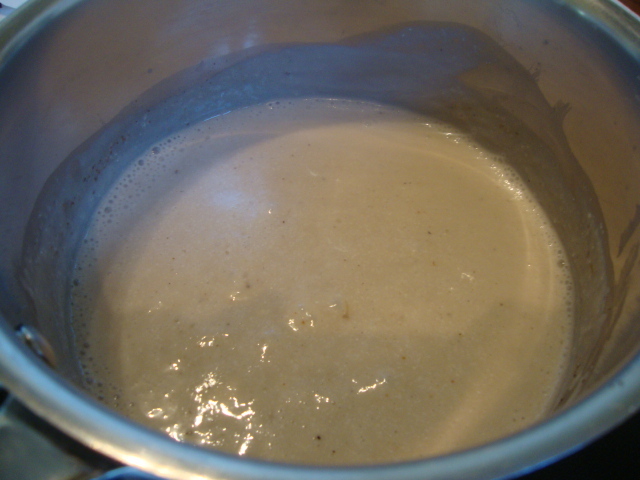 Bring to a boil, then reduce heat and simmer for 5-10 minutes, stirring often until dissolved. 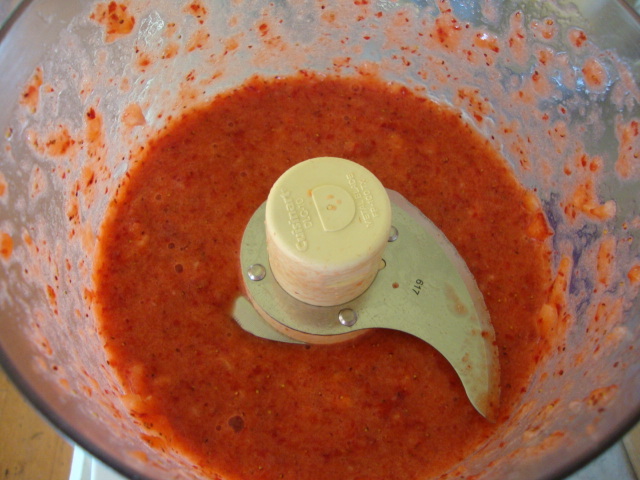 Transfer to a blender and add the rest of the ingredients; blend until very smooth. Pour it into the prepared mold. Place it uncovered in the refrigerator until it cools completely. Then cover it with a lid and let it chill for several hours, or overnight. To serve, I used a sharp knife to go around the edge—mostly to just break the suction. Turn it over and it will slide right out of the bowl. 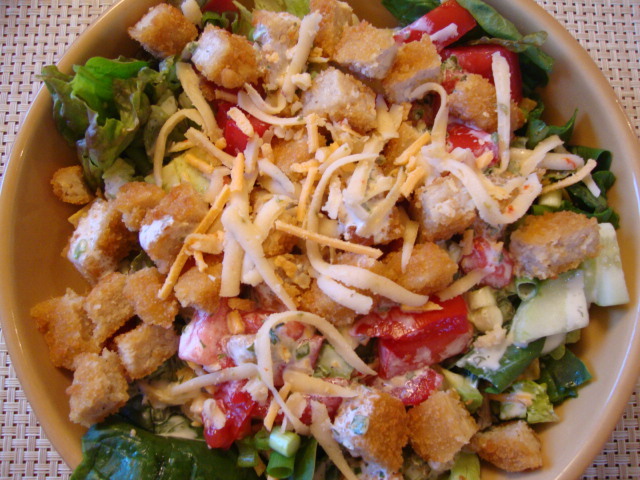 Cut it into wedges and serve with crackers. Like I said before, I recommend serving it warm; I think it taste much better that way. It will keep for 5-7 days. I don’t see why it can’t be wrapped up and frozen, too. 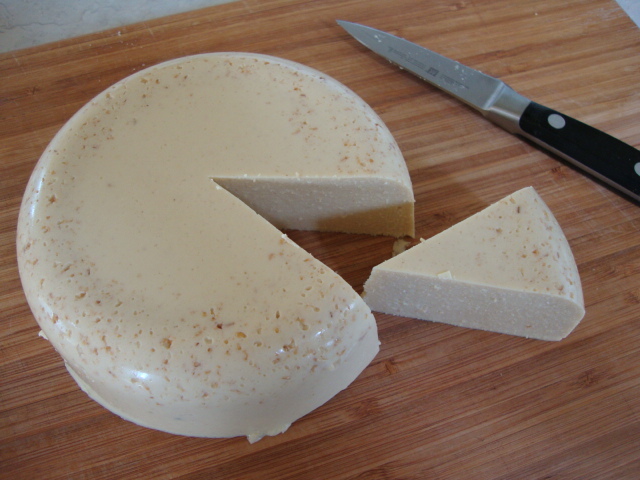 Vegan Brie -- Epicurean VeganThis recipe is from The Ultimate Uncheese Cookbook. I was intrigued. I've tried lots of other recipes from this cookbook and many have been outstanding, but there have been a few that just didn't do it for me. I was nervous about this one. Surprisingly, however, it's pretty delicious. I wouldn't say it's like brie; both with consistency and taste, but it does taste very good. The recipe doesn't mention this, but I highly recommending briefly warming this cheeze in the oven or microwave. It only takes about 10 seconds in the microwave. It seems to taste better when it's a bit melty. I also think this would be really tasty with some warm fruit compote over the top, such as warmed raspberries and blueberries. The possibilities are pretty endless! Place it uncovered in the refrigerator until it cools completely. 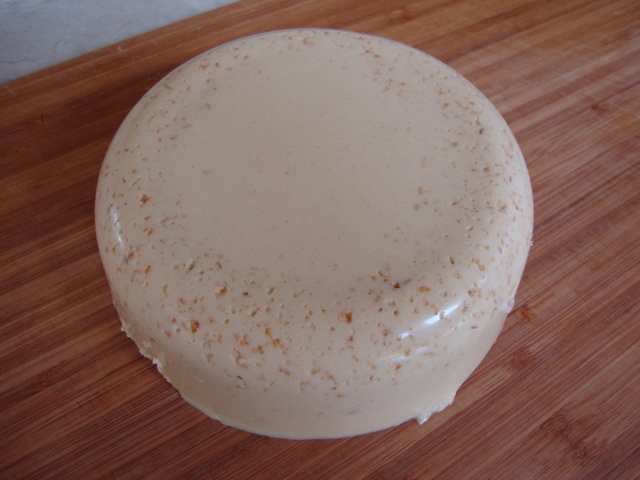 Then cover it with a lid and let it chill for several hours, or overnight. To serve, I used a sharp knife to go around the edge---mostly to just break the suction. Turn it over and it will slide right out of the bowl. 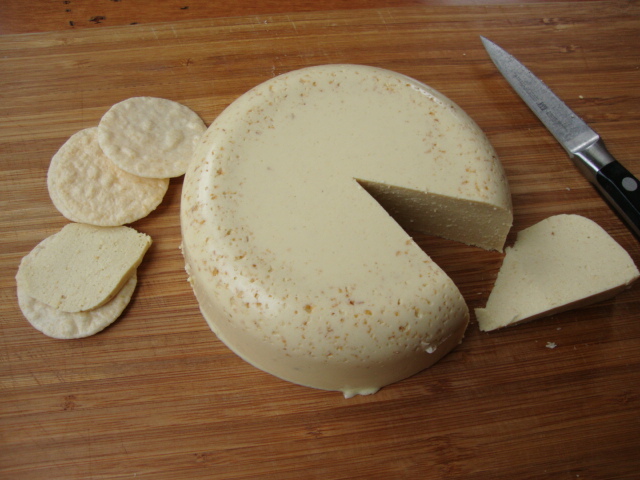 Cut it into wedges and serve with crackers. Like I said before, I recommend serving it warm; I think it taste much better that way. It will keep for 5-7 days. I don't see why it can't be wrapped up and frozen, too. I love making breakfast frittatas. They’re so easy to throw together and are perfect for cleaning out of the fridge of on-the-verge veggies. Since this one uses a Chipotle-flavored Field Roast Sausage, it supplies enough flavoring that I don’t add any other spices or seasonings to this dish, but feel free to add some if you’d like. Some fresh cilantro would be a great addition. Preheat the oven to 375. Layer the cracker pieces on the bottom of a pie plate; set aside. Sprinkle with about half of the cheese. In a large skillet, heat the olive oil. Add the shredded potatoes and over medium heat, cook them for about 5 minutes, stirring them around. Add the cabbage and continue to cook until both the potatoes and cabbage begin to brown. 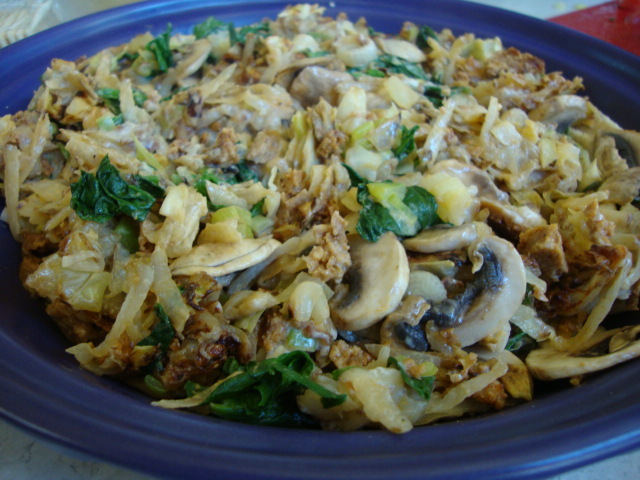 Add the Field Roast, spinach, mushrooms, and green onions and cook until the spinach starts to wilt. Stir in the sour cream to the spinach mixture and combine thoroughly. Pour the mixture on top of the cracker crust and spread it out evenly. Top with the remaining cheese and the diced tomatoes. Bake for 15 minutes. Let it cool for about 5 minutes, then slice into it and enjoy! I love making breakfast frittatas. They're so easy to throw together and are perfect for cleaning out of the fridge of on-the-verge veggies. Since this one uses a Chipotle-flavored Field Roast Sausage, it supplies enough flavoring that I don't add any other spices or seasonings to this dish, but feel free to add some if you'd like. Some fresh cilantro would be a great addition. 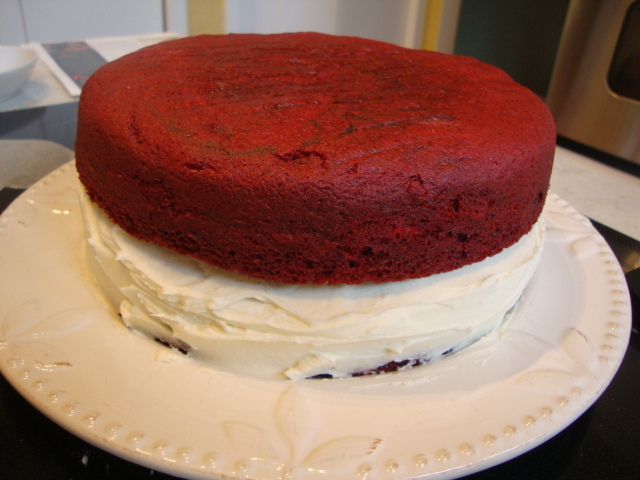 Some of you may recall when I made this cake about a year ago, I put in way, way too much of the flour mixture and a friend, who I had served it to, joked that I made him eat a brick. The cake was a disaster and apparently, it took me a year to get over it, but here it is. Wow, what a difference correctly following the recipe makes! 😉 This cake is outstanding! You’d never know it was gluten-free AND vegan! 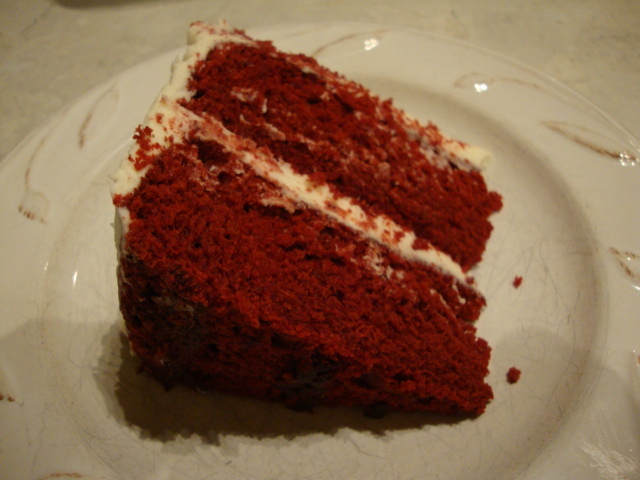 The cake was soft, moist, and not too sweet. (The icing will sure make up for that!) This is now going to be the family birthday cake for a while—it’s that good! Plus, I’ve completely redeemed myself and my friend told me he can no longer tease me about serving him a brick! Betsy’s Making Mix: this makes 7-1/2 cups–remember, use just 2-1/2 cups of it. Preheat oven to 350. Make your baking mix first: Combine all the flours in a large zip-lock bag. 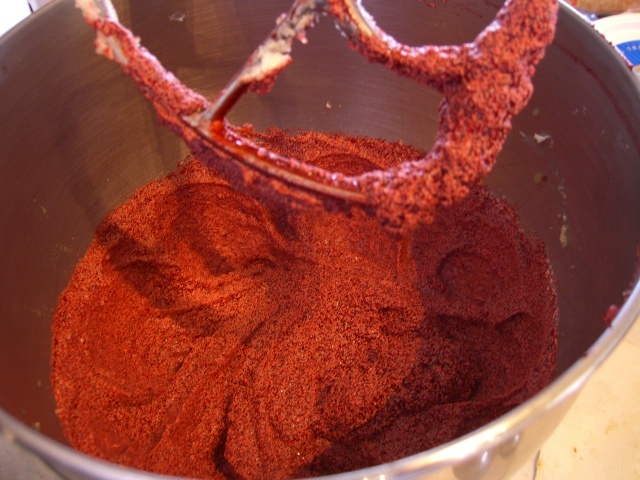 Using a whisk, blend them well. Then seal tightly and shake it vigorously for 1 minute. This mix will stay good for up to 3 months. In a large bowl, combine 2-1/2 cups of the baking mix, salt, and xanthan gum. In the bowl of a stand mixer, cream together the sugar and palm oil shortening. 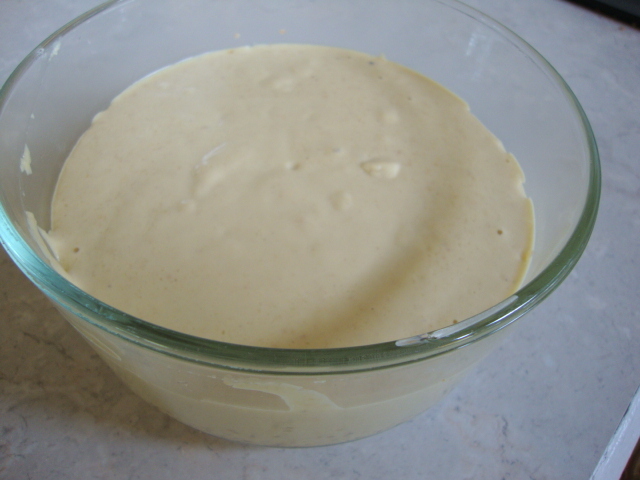 Add the applesauce and vanilla and cream everything together until mixture is light and creamy. Add the cocoa paste and mix well. Alternately, add the dry ingredients and the “buttermilk” mixture to the batter, beginning and ending with the dry ingredients. Pour the white vinegar into a small cup and sprinkle the baking soda over it. Immediately pour the fizzing combo into the cake batter and thoroughly mix it in. 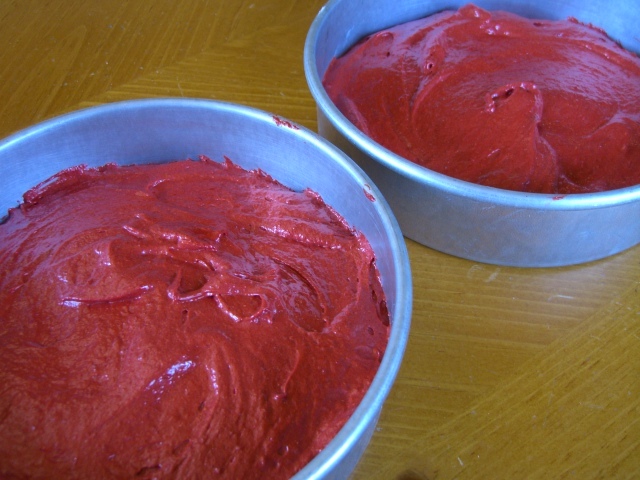 Evenly divide the batter into the two cake pans. 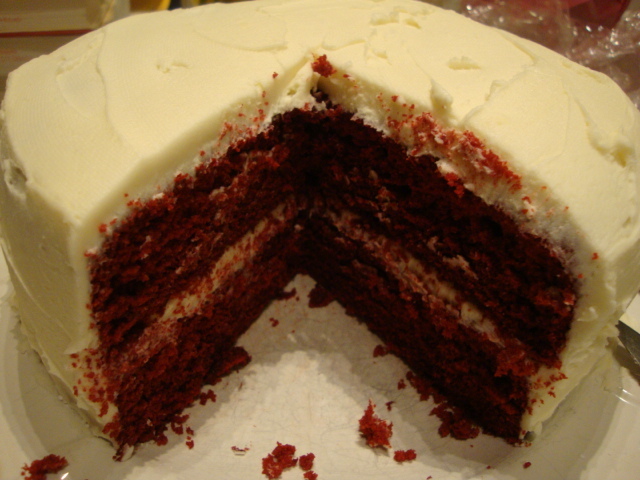 Bake for 30-35 minutes, or until a toothpick inserted into the center of each cake comes out clean. 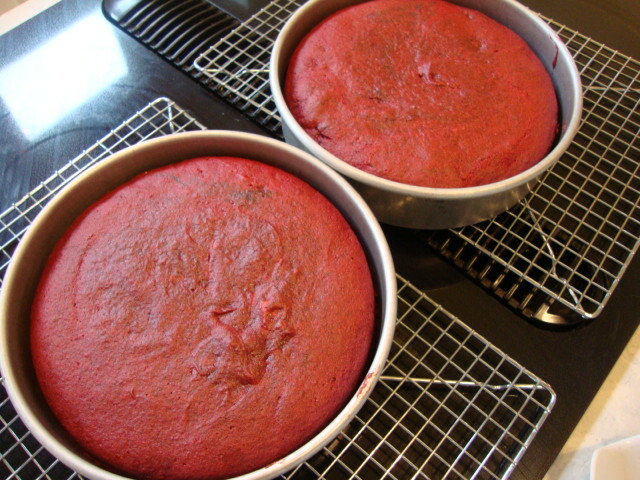 Let the cakes cool completely on a rack before turning them out of the pans. Once cooled, turn over the pans and remove the parchment paper. 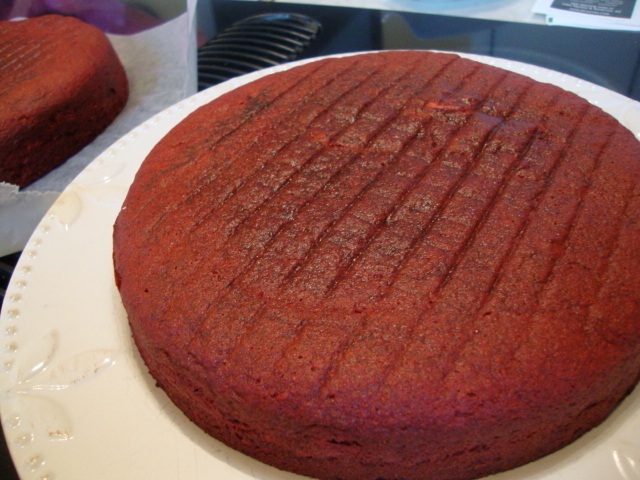 Take a large plate and place it upside down on the bottom of one of the cakes (that will be upside down on the rack). Flip over so the cake is face up on the plate. 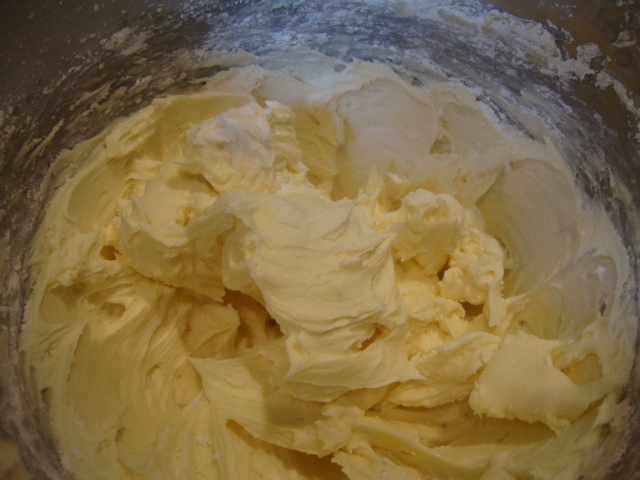 To make the frosting cream the margarine until smooth. Little by little, add the confectioner’s sugar. Add the vanilla rice milk 1-2 tablespoons at a time until you reach a thick consistency. Frost the top and sides of the cake that is on the plate. Lay it pretty thick, especially on the top. Carefully place the 2nd cake on top and frost that one. Slice and enjoy! Cover the leftovers and store in the refrigerator. This cake from Living Without is outstanding! You'd never know it was gluten-free AND vegan! The cake was soft, moist, and not too sweet. (The icing will sure make up for that!) This is now going to be the family birthday cake for a while---it's that good! Betsy's Making Mix: this makes 7-1/2 cups--remember, use just 2-1/2 cups of it. Grease 2 9" cake pans, line the bottoms with parchment paper, then grease the parchment paper; set aside. In a small bowl or measuring cup, combine the rice milk and cider vinegar to create "buttermilk" and set aside. 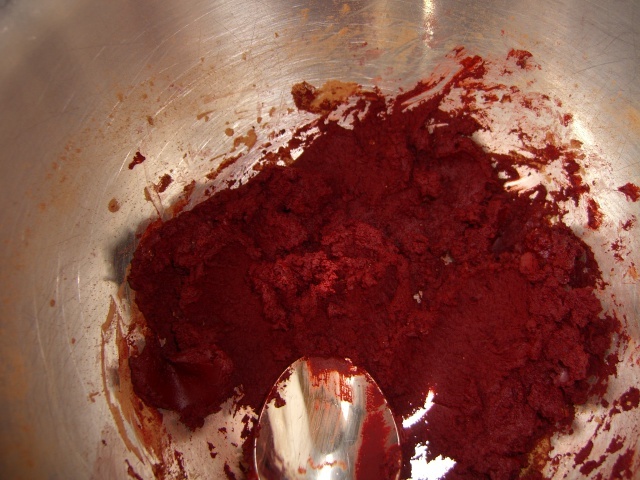 In a small bowl, use a spoon to combine the cocoa powder and food coloring. (Keep in mind that 1 ounce is a full-sized bottle of food coloring). It will form a paste. 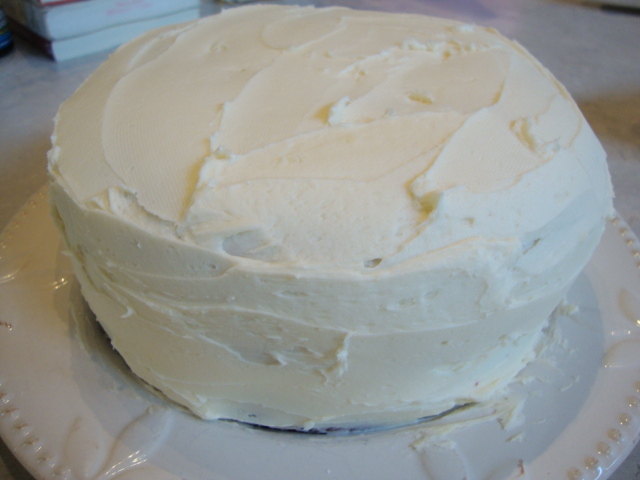 To make the frosting cream the margarine until smooth. Little by little, add the confectioner's sugar. Add the vanilla rice milk 1-2 tablespoons at a time until you reach a thick consistency. 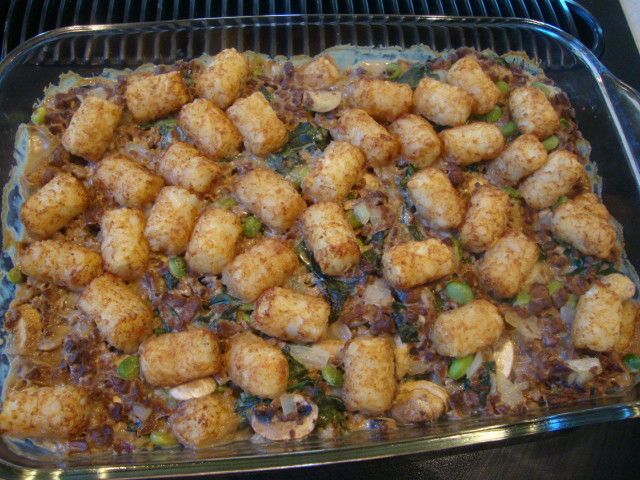 Please Pass the Tofu posted a tater tot casserole recipe and considering my guys love anything potato (tater tots being the Holy Grail) I knew this would be a hit with them. I made some modifications to the original recipe based on what I already had on hand. As expected, the guys loved it and are even fighting over the leftovers. Preheat oven to 375. In a large skillet, heat the olive oil and garlic. Add the onion and cook until soft, about 5 minutes. 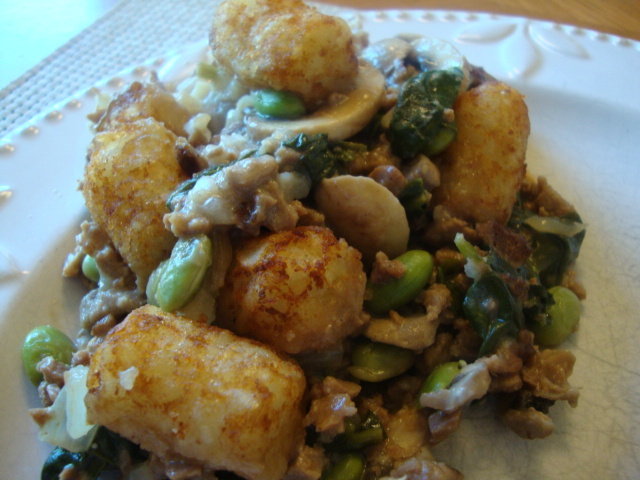 Add the soy crumbles and edamame; cook until heated through. 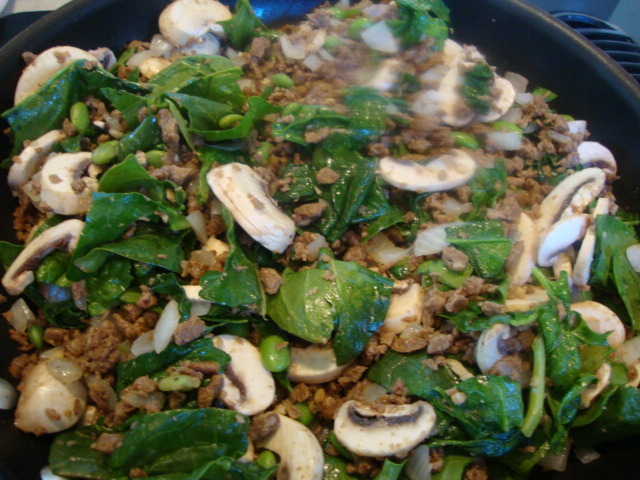 Add the mushrooms and spinach and cook until the spinach begins to wilt and the mushrooms soften. Meanwhile, in a saucepan, bring the mushroom broth to a boil. In a small bowl or measuring cup, whisk together the almond milk and arrowroot; whisk it into the broth. Once it begins to thicken, add in the sour cream and whisk until smooth. Season with the nutmeg, salt, and pepper. Pour the broth mixture over the crumble/vegetable mixture and combine well. Lightly spray a 9×13″ baking dish with cooking spray. Layer about 20-25 of the tater tots on the bottom of the pan. Pour the mixture on top and spread it out evenly. Top it off with the rest of the tater tots. Bake for 35 minutes, or until the tater tots are crispy. Enjoy! Pour the broth mixture over the crumble/vegetable mixture and combine well. Lightly spray a 9x13" baking dish with cooking spray. Layer about 20-25 of the tater tots on the bottom of the pan. Pour the mixture on top and spread it out evenly. Top it off with the rest of the tater tots. When I open my own vegan restaurant, this tart will be a signature item on the menu! And look, I’m sharing my secret recipe with all of you now! The Husband was on a conference call when I took this out of the oven and took a bite. You have no idea how difficult it was to not eat his portion; he would have never known. But of course, I couldn’t do that to him—it’s a recipe you’ll want to share and enjoy with others. Preheat oven to 400. 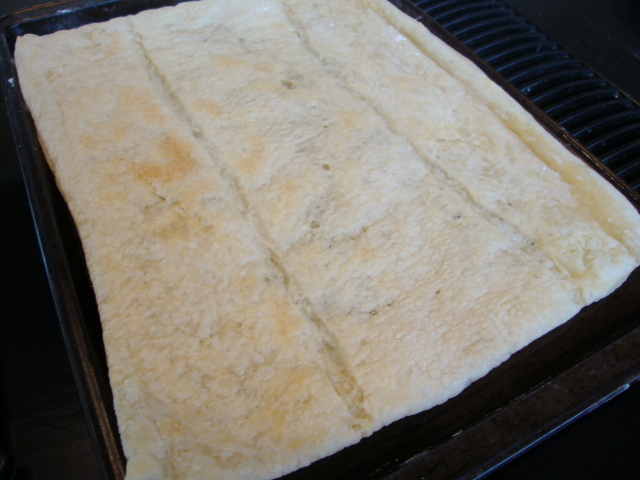 Roll the pastry sheet out to about 11″x7″. 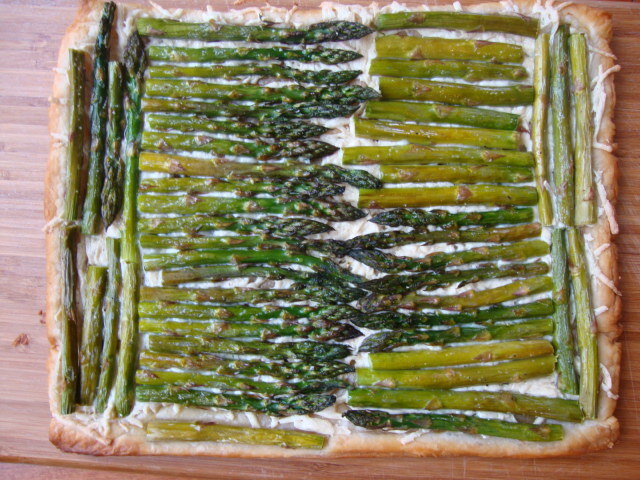 Place onto a baking sheet. Using a fork, puncture the dough all over. Bake for 5 minutes, or until it begins to brown. You may need to press down on the dough with a spoon if it puffed up in places. In a small bowl, whisk together the olive oil, truffle oil, salt, and pepper. 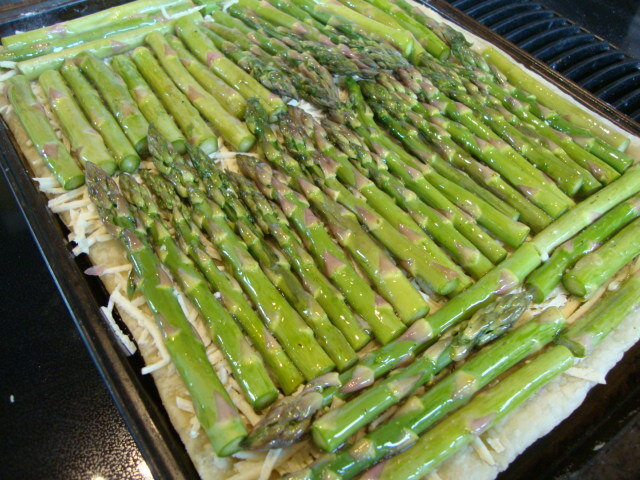 Brush the mixture onto the asparagus , thoroughly coating the tops. Bake for 20 minutes, or until the edges of the tart begin to brown. Remove from the pan (I used two spatulas on either end) and transfer to a large cutting board. Cut into squares and enjoy! When I open my own vegan restaurant, this tart will be a signature item on the menu! And look, I'm sharing my secret recipe with all of you now! The Husband was on a conference call when I took this out of the oven and took a bite. You have no idea how difficult it was to not eat his portion; he would have never known. 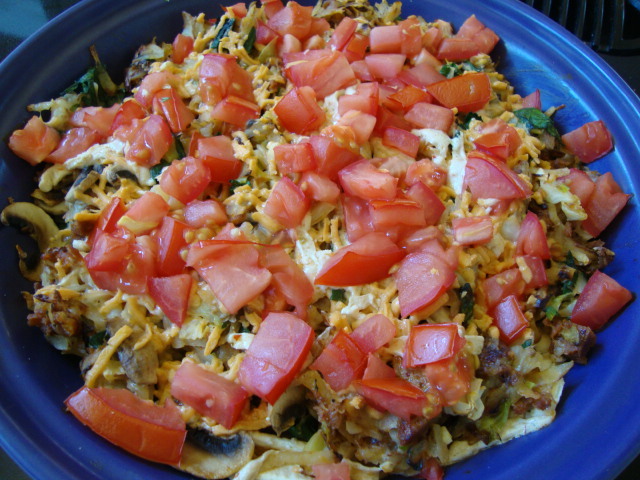 But of course, I couldn't do that to him---it's a recipe you'll want to share and enjoy with others. Preheat oven to 400. 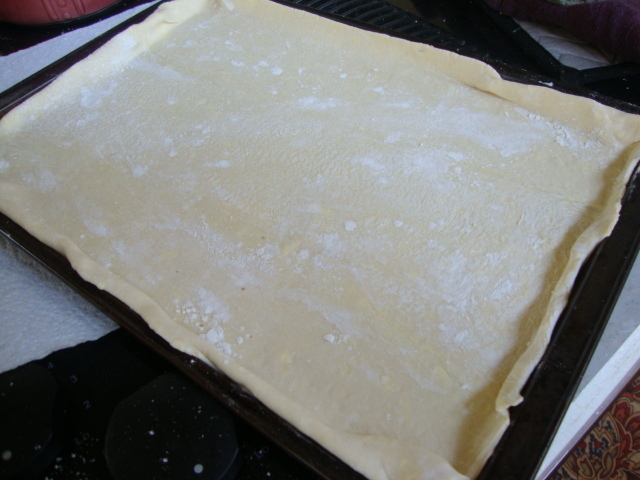 Roll the pastry sheet out to about 11"x7". 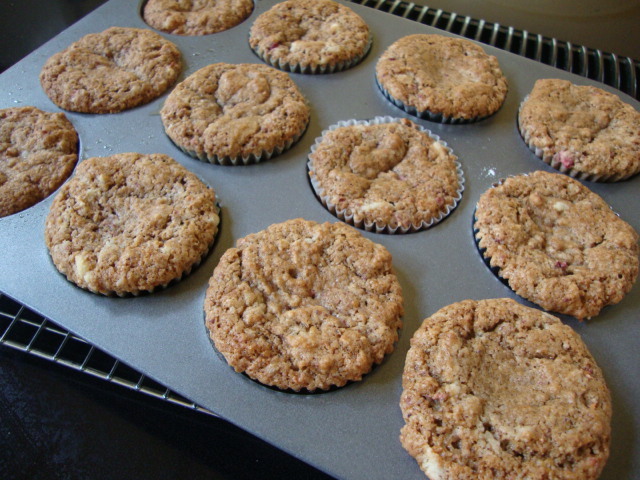 Place onto a baking sheet. Using a fork, puncture the dough all over. 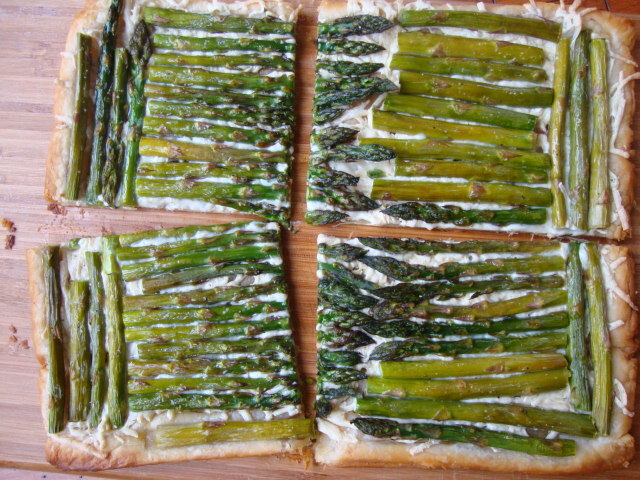 Sprinkle the cheese onto the dough, then line the asparagus---close together---on top. I just cut the stalks in half (after cutting of the thick ends) and placed them in rows on the puff pastry. I tend to make cold pasta salads in the spring and summer and I think I’ve been craving them, but I went with making it warm—just seemed like the thing to do. It came out delicious and I’m anxious to try the chilled leftovers! Cook pasta according to package instructions; drain. 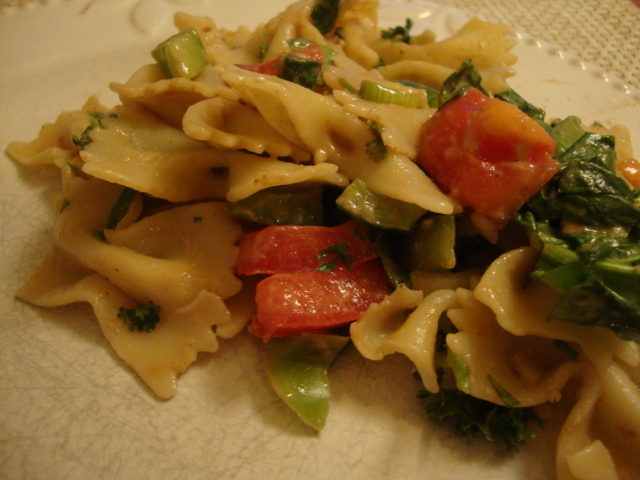 Return to the pan and add the spinach, basil, parsley, green onion, bell pepper, and tomatoes. 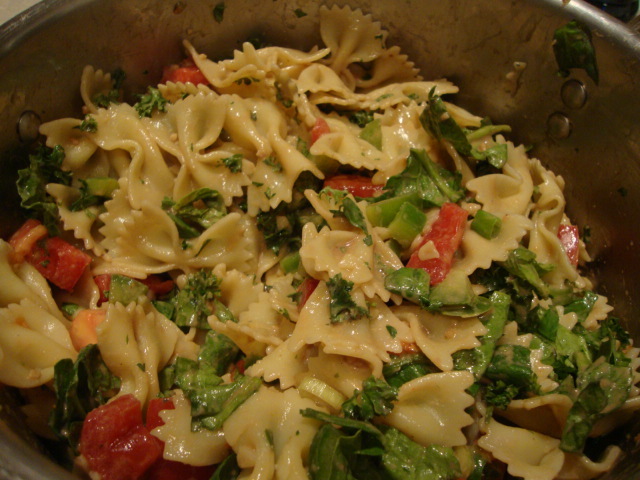 In a small bowl, whisk together all of the dressing ingredients; add to the pasta mixture and coat well and enjoy! 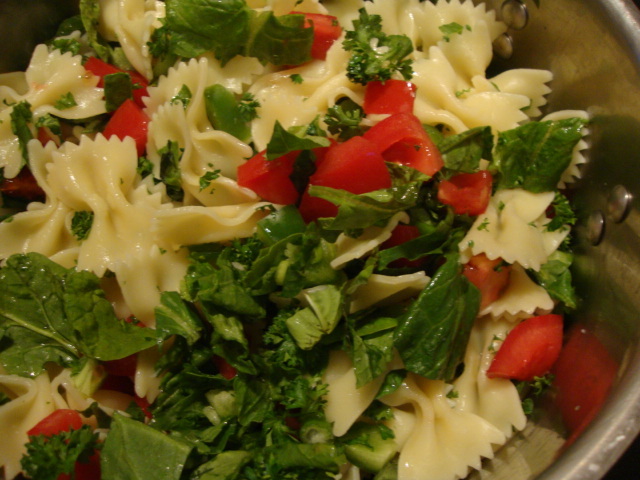 I tend to make cold pasta salads in the spring and summer and I think I've been craving them, but I went with making it warm---just seemed like the thing to do. It came out delicious and I'm anxious to try the chilled leftovers!